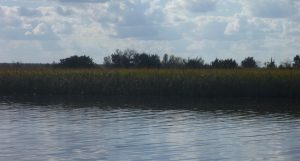 We scheduled our departure from Charleston, SC with slack water so as to make it easier to back the boat out of the slip and navigate the fairway with as little current as possible. It was a beautiful, albeit cooler than desired, morning as we navigated the Charleston Inlet and headed out to the ocean for what will be our longest passage to date to Brunswick, Gerogia. 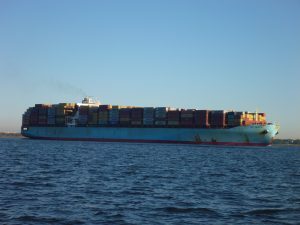 Sometimes you just feel small, and that was the case as this large container ship came up from behind us in the inlet requesting that we give him room as another equally large ship was inbound and they would need the entire width of the channel to pass safely. We happily obliged as the the water just outside the channel has plenty of depth and we drove around in circles until the two ships had passed. We had a couple of dolphin sightings on the passage, the first one while we were still in the inlet, when Christina called out “flying dolphin” as she gazed to port and saw a dolphin breaching fully out of the water. He and another dolphin then swam quickly to our boat and swam alongside for a few minutes. Later in the afternoon there was one swimming along side and dropped behind the boat and seemed to look us in the eye to say “hello”. The last one of the passage was in the middle of the night when another few swam alongside again. 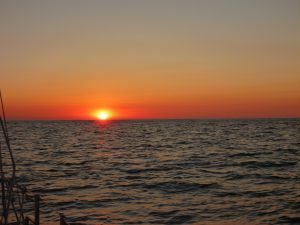 When you are out on the ocean there isn’t much to take photos of – except the sunsets and sunrises. This was tonight’s sunset. As the night wore on the water and wind churned up and we were rockin’ and rolling for several hours. It was the most movement we have experienced on the boat in some time. For the person sleeping it was great for lulling them to sleep, for the person on watch it meant holding on as they moved around the cockpit or went below. But all was well. After 150 miles and nearly 27 hours we arrived at Brunswick Landing Marina, having to navigate around dredging equipment that went across virtually the entire river to the marina. 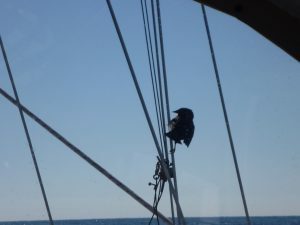 We radioed and he moved a bit to the side so we could pass without much concern – but it was a good thing that Bob was looking ahead to see the equipment – or else we may have had a rough end to the trip. We will be at Brunswick Landing Marina for 2 or 3 nights, probably partaking in the marina Thanksgiving festivities before we head on down to St. Augustine, FL. We are enjoying the overnight passages. 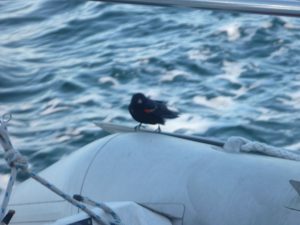 We also had a small bird join us as we crossed Lake Huron – he left just before we had to declare him as a passenger as we cleared into Canadian waters. Fair winds! Previous Previous post: Dolphins, dolphins and more dolphins…..